The David Winton Bell Gallery will present Malangatana: A 40-Year Survey of a Contemporary Mozambican Artist April 13 through May 27, 2002. A reception for the artist is scheduled for Saturday, April 27 at 7 p.m. at the gallery in the List Art Center. PROVIDENCE, R.I. — A lifetime of work by a major African artist will be on exhibit when the David Winton Bell Gallery presents Malangatana: A 40-Year Survey of a Contemporary Mozambican Artist, from April 13 through May 27, 2002. A public reception for Malangatana is scheduled for Saturday, April 27 from 7 to 8:30 p.m. in the Bell Gallery, located in the List Art Center. Best known for his dramatic paintings, Malangatana is an internationally recognized artist who has produced a broad range of work in diverse mediums – from drawings, murals, ceramics and sculpture, to poetry and music. His exhibition at the Bell Gallery will feature some 15 of his paintings and 25 of his drawings, spanning the past 40 years of his career – and, for the first time, introducing his larger creative opus to the North American public. Editors: Digital images are available upon request from the News Service. 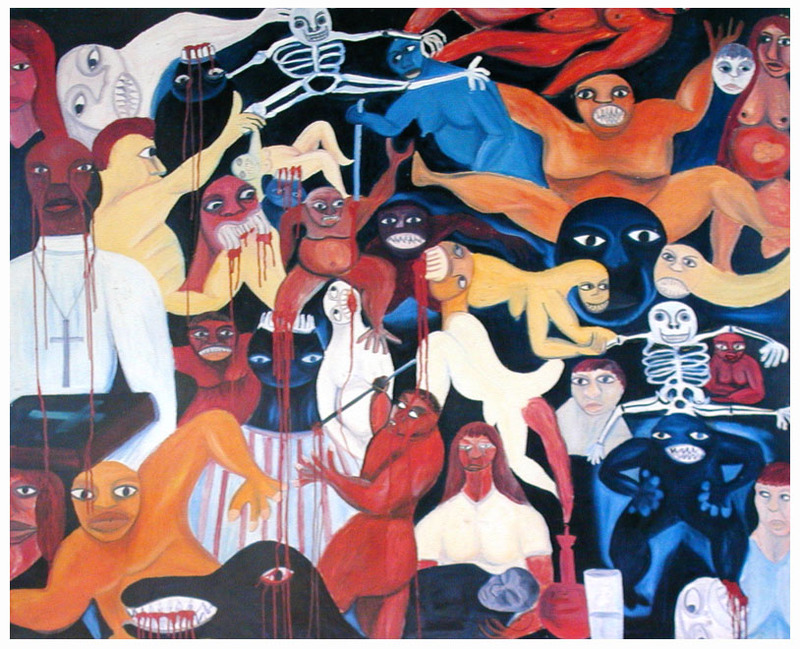 Final Judgment (Juzo Final), above, was created in 1961; 92 x 122 cm (courtesy of the artist). Malangatana’s works are frequently commentaries on the historical and political events in his country, including Portuguese colonialism and Mozambique’s anti-colonial struggle, civil war and independence, according to Vesela Sretenovic, curator for the Bell Gallery. His works explore broader universal themes of violence and resistance to violence, capturing both the hardship of human life and its heroic aspects, she said. Malangatana Ngwenya was born in Matalana, Mozambique, in 1936. He moved to Maputo in the 1950s to study art and first presented his work to the public in 1959. A solo exhibition followed in 1961. From then until 1993, much of his work reflected the political turmoil of his country. With the arrival of peace in 1992 and the multiparty elections of 1994, his style began to reflect the lighter and more optimistic period in Mozambique’s history. Malangatana was instrumental in the establishment of the Mozambican National Museum of Art and the country’s Centre for Cultural Studies and Centre for the Arts. He was a founding member of the Mozambique peace movement, and he has been a pioneer in community and public art in Africa. As an UNESCO international goodwill ambassador, Malangatana has used his art to advocate for significant social issues and change worldwide. Malangatana’s work has been included in numerous exhibitions in Angola, Cuba, Portugal, India, Nigeria, Chile, Zimbabwe, Cape Verde, Nigeria, Bulgaria, Switzerland, Uruguay, Belgium, India and Pakistan. In the United States, his work has been shown at the Smithsonian’s Museum of African Art and is currently on view in the exhibition The Short Century: Independence and Liberation Movements in Africa, 1945-1994 at the P.S.1/ MoMA in New York City. The Bell exhibit has been organized in conjunction with Portuguese/African Encounters – An Interdisciplinary Congress, a conference scheduled at Brown April 26-29, 2002, and sponsored by the Thomas J. Watson Jr. Institute for International Studies and the Portuguese and Brazilian Studies Department. The exhibition and the artist’s reception are free and open to the public. The Bell Gallery is located on the first floor of the List Art Center, 64 College St. The Gallery hours are Monday through Friday, 11 a.m. to 4 p.m., and Saturday and Sunday, 1 to 4 p.m. For more information, call (401) 863-2932.